This is a special award to recognize individuals (not necessarily chemists) who have made outstanding contributions to the upliftment of chemistry in the Philippines through leadership advocacy and exemplary work. The following are excluded from the nominations: members of the PFCS board, members of the PFCS Awards Committee and the members of the National Organizing Committee and the Steering Committee for the 30th Philippine Chemistry Congress (PCC). The deadline for submission is on or before 16 February 2015. Dr. Armando M. Guidote, Jr. Nominees were evaluated according to: Grade in Chemistry (60%), Participation in Science/Chemistry Quizzes & Events (30%), Recommendation (10%). The top ten students are given medals and certificates. 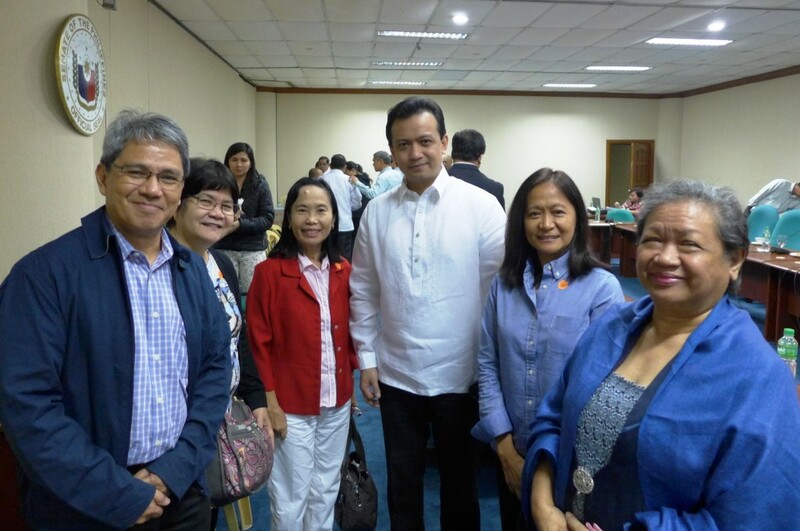 The Senate Committee on Civil Service and Government Reorganization, under the chairmanship of Senator Antonio Trillanes IV conducted a public hearing on the proposed revision of the Chemistry Law on January 27, 2014, at the Senate Building. Senate Bill 914, entitled “AN ACT TO REGULATE AND MODERNIZE THE PRACTICE OF CHEMISTRY IN THE PHILIPPINES, REPEALING FOR THE PURPOSE REPUBLIC ACT NUMBERED 754 ENTITLED “AN ACT TO REGULATE THE PRACTICE OF CHEMISTRY IN THE PHILIPPINES”, AND FOR OTHER PURPOSES” was also filed by Sen. Trillanes last July 18, 2013 in the Sixteenth Congress. Dr. Adoracion Resurreccion, chair of the Board of Chemistry, attended the public hearing representing the Professional Regulation Commission. The Board of Chemistry manifested its support for SB 914. Also present to endorse SB 914 were the officers of the ICP, Dr. Fabian Dayrit (president), Ms. Edna Mijares (vice-president), and Dr. Lilibeth Coo (treasurer). Dr. Aida Aguinaldo, Outstanding Chemistry professional for 2004, also attended the public hearing to show her support. The bill will be finalized by a technical working group before being presented again in another public hearing. A House version of the bill has also been filed by Congresswoman Victoria Isabel Noel and is awaiting public hearing at the Batasan. View the Senate Bill 914 HERE. View the Board Position on the Senate Bill 914 HERE. The Professional Regulation Commission (PRC) and the Professional Regulatory Board of Chemistry announce today, January 13, 2014 the rescheduling of the Chemists board exam originally scheduled on May 14-15, 2014. The Board of Chemistry resolved to amend PRC Resolution No. 2013-782 by issuing Board Resolution No. 1 dated January 8, 2014 rescheduling the Board Licensure Examination for Chemists to SEPTEMBER 16-17, 2014 and the deadline for the filing of applications on AUGUST 27, 2014. According to the Board, the move to reschedule the date of the exam is based on the clamor of the academe and members of the Integrated Chemists of the Philippines to retain the old schedule which is on September of every year on account of the limited time to afford prospective examinees to secure the examination requirements and to prepare for the examination itself. Retrieved from PRC Board News Website. The Professional Regulation Commission (PRC) announces that 320 out of 571 passed the Chemist Licensure Examination given by the Board of Chemistry in Manila this September 2013. The ICP welcomes its newest cluster composed of chemists in the Philippine National Police Crime Laboratory. The officers of the Philippine Association of Forensic Chemists (PASSFORCHEM) were inducted into office by the Deputy Chief of the PNP for Administration, PDDG Ager P. Ontog, Jr., during the celebration of the 68th PNP Crime Laboratory Founding Anniversary which was held in the PNP multi-Purpose Center, Camp Crame, on June 17, 2013. Read the entire article on the ICP Website. The Outstanding Chemist for 2013 is given to Dr. Amelia Peralta Guevara, Undersecretary, Department of Science and Technology. She obtained her BS, MS, and PhD Chemistry degrees from the University of the Philippines Diliman. She dedicated most of her professional service to U.P. where she rendered outstanding service as a faculty member and researcher. She conducted research in the areas of Natural Products Chemistry and the Chemistry of Mutagens. Read the entire article from the ICP Website. Nominations for membership in the ICP board are now open. Three board members, one representative each from the industry, government and academe will be elected to serve a three-year term (2013-2016). Members of the board are expected to reguarly attend meetings of the ICP and actively participate in the activities geared towards achieving the objectives of the ICP as follows. (UPDATE) Ariella Arida is crowned Bb. Pilipinas-Universe 2013. The stunning lady who hails from Laguna bested 49 other contestants during the coronation night held at the Smart Araneta Coliseum on Sunday night, April 14. The 24-year-old winner is a Chemistry graduate from UP Los Baños. Read the entire article from Yahoo! OMG! Philippines. The Philippine Federation of Chemistry Societies (PFCS), in cooperation with Dow Chemicals, Chemrez, Boysen, and Shell, is proud to present the top three winners for the 3rd Children’s On-the-Spot Poster Making Competition: Isabelle Manto from Saint Jude Catholic School (1st place), Gabrielle Kristine Entice from South City Central School (2nd place), and Jean Edsel Gonzalbo from Tomas Morato Elementary School (3rd place). Dr. Nemesio “Coke” Montaño, professor and researcher at the UP Marine Science Institute, is the Outstanding Chemist for 2012. He was a guest speaker during the Oath-taking and Induction of New Chemists held at the Centennial Hall of the Manila Hotel in October 2012. Hon. Ramon Magsayday Jr., former senator; Commissioner Alfredo Po of PRC; Dr. Adoracion P. Resureccion (Chairman, Board of Chemistry); Dr. Soledad S. Castañeda (Member, Board of Chemistry); Academician Dr. Fabian Dayrit and other officers of the ICP, KKP and PACT; our honored guests; fellow chemists and mentors; ladies and gentlemen. I am reminding you that FACS is now receiving the recommendations of the possible candidates for the FACS Awards and FACS Citations from member societies. The deadline is extended to March 31, 2013. I would like to inform you that the Federation of Asian Chemical Society will be presenting the following Awards at the 15th Asian Chemical Congress (15ACC) that will be held in Singapore, from August 20-23, 2013. So far, I have received only one recommendation from Philippine Federation of Chemistry Societies. The Integrated Chemists of the Philippines (ICP) conducted a one-day Basic Training Program on the Globally Harmonized System of Classification and Labelling of Chemicals (GHS) last October 27, 2012, at the Ateneo de Davao University. The Junior Chemistry Congress 2012, organized by the Philippine Association of Chemistry Students, Incorporated, was held September 29, 2012 at the Chemrez Room, Institute of Chemistry, National Science Complex, University of the Philippines Diliman. The Philippine Association of Chemistry Teachers (PACT) Inc., in cooperation with the San Beda College of Arts and Sciences, recently held it 51st National Convention last October 25-27 at the San Beda College in Mendiola. Basic and tertiary education teachers representing schools from all over the country, from Tuguegarao to Sultan Kudarat, participated in the event. With the theme “ChemS3: Society, Sustainability, Safety”, the gathering featured lectures and fora addressing critical issues such as National Development, the K-12 Initiative, Water Quality, Chemistry and Law Enforcement, and Boons and Banes of Technology in the Classroom.